Holden Special Vehicles (HSV) has released pricing and specification for its locally converted Chevrolet Silverado, with the hulking American-sourced full-size pick-up truck including a trade-oriented workhorse variant that opens the range at $114,990 plus on-road costs. Although well above the price of mid-size one-tonners that make up the vast majority of ute sales in Australia, the 2500HD WT – for ‘Work Truck’ – is positioned about $25,000 below the most affordable version of the rival Ram 2500 which is also converted locally in a joint venture (American Special Vehicles) between HSV parent Walkinshaw Automotive Group and Ateco Automotive. From there, the Silverado steps up to $134,990 for the 2500HD LTZ, or $139,990 for either of the two LTZ-based special editions (Midnight or Custom Sport), while the bigger 3500HD (with longer tub and dual rear wheels) starts at $147,990. For the money, buyers are getting a heady combination of size, power, payload and towing capability. All ‘Silverado by HSV’ variants are crew cabs that measure 6085mm in overall length, 2388mm in width and 1985mm in overall height. The cargo box is more than 2m in length (2003mm) and measures 1296mm between the wheel arches, which in the WT version house 18-inch painted steel wheels with Goodyear Wrangler SR-A tyres (265/70 R18). In comparison, the mid-size Chev/Holden Colorado dual cab is 5361mm long, 1874mm wide and 1800mm high, and has a tub length of 1484mm. Maximum width in the tray is 1534mm. 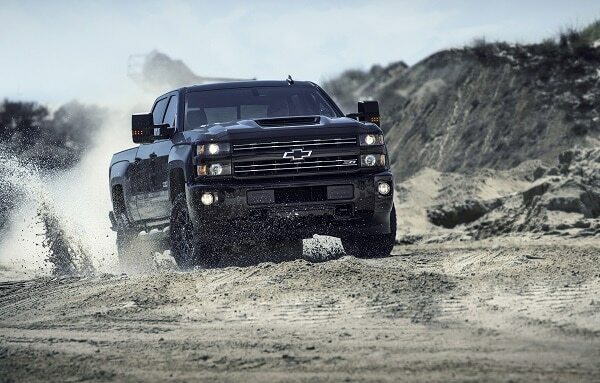 Under the bonnet of the Silverado is a mammoth 6.6-litre turbo-diesel V8 engine that produces 332kW of power and no less than than 1234Nm of torque, driving through an Allison 1000 six-speed automatic transmission and 4×4 system with heavy-duty locking rear differential. The Work Truck tips the scales at 3516kg, has a 4491kg GVM, 975kg payload, front and rear axle capacity of 2000kg/2818kg respectively and a braked towing capacity of up to 5890kg using a pintle. A 70mm tow ball allows a 4500kg limit, while a 50mm ball brings capacity back to 3500kg. Stopping power is aided by front and rear ‘DuraLife’ disc brakes with ABS, while GM’s StabiliTrak electronic stability control system is also on board, bringing with it traction control, ‘proactive roll avoidance’, trailer sway control and hill start assist. A rear-view camera is provided and there is plenty of airbag protection for the front and rear compartments – dual front, front and rear side/thorax and full-length curtain – while higher-series variants have more advanced driver-assist features such as lane departure warning, forward collision alert and front/rear park assist. The WT cab is a six-seater, with a 40/20/40 split-fold bench up front fitting three. The rear bench seat also splits 60/40 with fold-up functionality. Dark interior trim is used and convenience features at this entry level run to the Chevrolet MyLink infotainment system with 7.0-inch colour touchscreen, six-speaker stereo, USB ports and auxiliary input jack. Remote keyless entry, a remote locking tailgate and tinted windows are also there, but a step up to LTZ is required for remote start, extra exterior bling and creature comforts such as leather-upholstered seats (with heating), dual-zone climate control, power-adjustable pedals, a better Bose stereo and larger 8.0” touchscreen with higher functionality including sat-nav, Bluetooth audio streaming, Apple CarPlay/Android Auto capability, hands-free smartphone integration and so on.